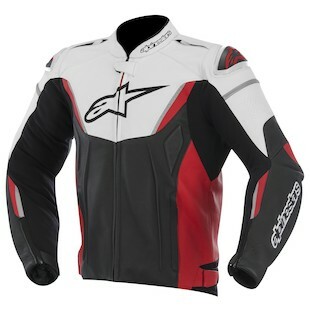 You didn’t think Alpinestars could use “GP” or “R” in another jacket and still be original, did you? You said “yeah, they’re cool, but literally everything from Alpinestars has some ridiculous prefix - what’s the deal?” Much like airline food, we have no idea what the deal is. That’s a lie, it’s the altitude. Google it. 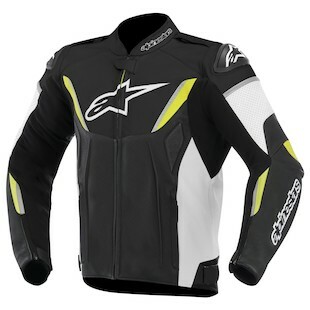 Funky naming conventions aside, the new Alpinestars GP-R Leather Jacket is cleaning up to be a home run. What’s new? Well, the shoulder slider has been redesigned for a lower profile and sportier look. Alpinestars has used their new bio armor CE rated pads too, which compliment the aggressive fit. Reflectivity was added on the chest, arms, and back as an SUV repellent. And if Alpinestars didn’t quite fit you before, now there’s a few more stretch panels and elasticated bellows to make sure your leathers fit like a . . . uh . . a glove. Sorry about that. Moving right along - a wrist closure redesign (with added stretch material) allows you to fit slimmer gloves over the cuff. And for you fashionistas, all the Alpinestars logos are now embroidered, which adds a nice hand-made touch. For those hot days, the Alpinestars GP-R Perforated Leather Jacket is here to provide the same features as the standard version, yet with a more well-ventilated shell. With the addition of perforation to the outer leather, more air is able to get to the body and thus provide a cooler overall ride. Nobody likes to sweat it up in leather, so if you ride in the heat of summer or live in an area that is generally hotter than it is cool, this would be a solid option. Have Alpinestars reinvented the wheel? Not really, but they have made a lot of key improvements over what is already considered one of the finest moto jackets on the market. At only $80 more than the GP-Plus R, it’s a no brainer why the GP-R exists. Want an all around quality leather with all the nice bits of the big guys, but that doesn’t cost $900? We’ve got just the jacket for you.